Image via Vibrant Mud, LLC. Near the end of Muppet Guys Talking, puppeteer Dave Goelz is asked a question about where he’s found the nobility in his life’s work. “[In] folly,” he answers. “Human folly. Celebrating the degree to which we’re all lost.” That’s just one instance of how this documentary about the world’s favorite puppets gets surprisingly deep. 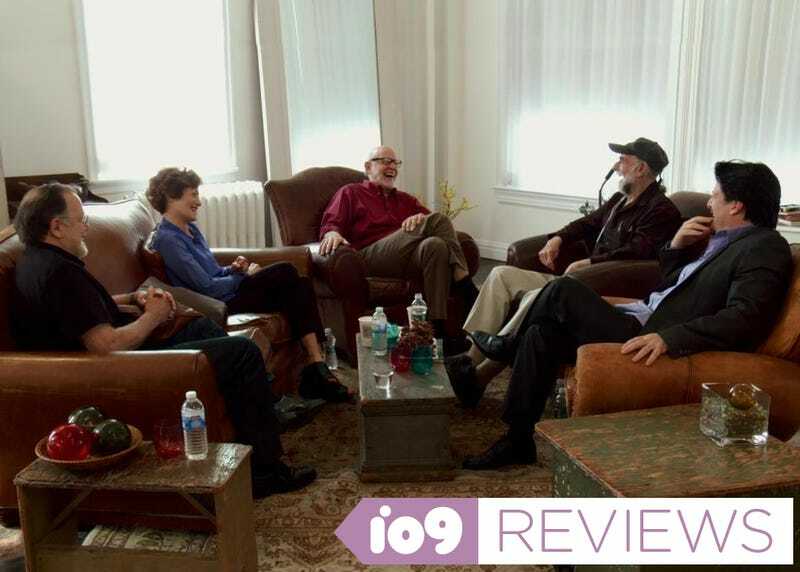 Directed by Frank Oz and screened this week in Austin at SXSW, Muppet Guys Talking is a warm, unassuming film that documents a reunion of five people who worked with Jim Henson. The movie is essentially a recording of a 10-hour hang-out in 2012 that Oz had with Goelz, the man who’s brought Gonzo and Dr. Bunsen Honeydew to life for decades, Fran Brill (Prairie Dawn), Jerry Nelson (Count von Count), and Bill Barretta (Rowlf, Pepe the King Prawn). Oz, having performed as Yoda and Miss Piggy, is among the best known of the crew but the point of the film is to let audiences know about some of the more unheralded puppeteers who helped bring the Muppets to full bloom. Oz shared similar insights about Fozzy, saying that, in his mind, the character doesn’t have a key to the Muppet Theater where he performs. But the schlocky comedian shows up at 6:00 a.m. every morning, wanting to be in “the show business.” “He’ll never succeed at being funny but he’ll never stop trying,” Oz said. Gonzo is crazy but free, Bunsen is specific but misses the big picture and Zoot is in his own world. Some of these truths have been obvious to people who’ve watched the Muppets but, in the cases where they weren’t, the insights will make you appreciate the characters even more. Muppet Guys Talking stands as a testament to the enduring opposite reaction to the Muppet oeuvre: we’re giggling with these creators, not at them, and there’s a deep well of gratitude underneath all the laughter.